Bodzash Photography and Astronomy: Is the Shroud of Turin the World's First Photograph? Is the Shroud of Turin the World's First Photograph? The Shroud of Turin: Holy relic or world's first photograph? Today is Easter Sunday, the day that billions of believers all over the world hold to be the anniversary of Jesus Christ's resurrection. While religion is, by and large, an issue of faith, believers in the resurrection have a unique piece of "proof" for their belief: an ancient shroud bearing the image of a crucified man, the man being believed to be Christ himself. The cloth in question is the famous Shroud of Turin, but is it real? The Shroud of Turin has been an enigma ever since it first came to light in the mid 1300s. Always a local curiosity, the Shroud shot to fame in 1898 when Italian photographer Secondo Pia photographed the Shroud for the first time. While the actual photos were nothing to write about, the negatives (pictured) were stunning. From that point on, there was a clamor to prove or disprove the Shroud's authenticity. So is the Shroud real or fake? It is a question where there are many opinions but no conclusive answers. 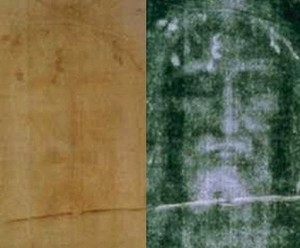 For art historian Nicholas Allen, not only is the shroud a fake, but it's also the first photograph, too.As absurd as the idea seems at first glance, Allen's theory may just be true, as it is based on sound photographic principles. The first piece of the puzzle is camera obscura. While not a camera in the traditional sense, camera obscura does capture and reproduce images, albeit on walls rather than film. The principles behind camera obscura were known since before the birth of Christ. Simply a box with a hole on one side, a lens in the hole, and a screen on the other, light passes through the lens and an image is reproduced on the far side of the chamber. This is the same ideas as in the modern pinhole camera. Okay, camera obscura is an ancient trick for capturing and projecting images, but could it be used for a subject the size of a human? Absolutely. The largest examples of camera obscura are room-sized, plenty big for a human-sized subject. So, if people knew about camera obscura in the 1300s, they very well could have constructed one room-sized, too. The camera obscura is only one piece of the puzzle. Now comes the part that requires a leap of faith possibly big as believing in the authenticity of the Shroud itself. According to the Shroud is a photo theory, the cloth itself acted as the film. Silver salts are light sensitive and, when cloth is treated with such chemicals, it can be turned into "film." Exposed to the light for a period of time, an image will appear on the cloth. In practice, very simply. The body would be hung outside the camera obscura chamber so that its image would be projected through the lens and onto the rear wall opposite the opening. Now, to create an image, the treated cloth would be placed between the body and wall so that the image would fall on the cloth instead. Left exposed for enough time, a negative image would eventually appear on the cloth. The results of these recreations are both impressive and Shroud-like (scroll about 2/3 way down). In theory, this sounds simple. In practice, there is one big problem: did anyone in the 1300s know the light sensitive properties of silver salts and would anyone have even thought to do such a thing at the time? With modern knowledge, it is very easy to reverse engineer an ancient problem, but the question of whether this would have been thought of at the time remains unknowable. In the end, the Shroud of Turin is a mystery that will probably never be solved, which is good for the faithful and the investigators alike.For people interested in this Shroud is a photo theory, keep your eyes on local PBS schedules as the show "Secrets of the Dead" briefly explored this idea in an episode a few years back and reruns are still aired from time to time.